"Public health TB programs protect the health of the public every day by finding and treating active cases of TB in our communities. To protect us all, they make sure that TB is treated regardless of a patient's insurance status or ability to pay." said Margo Sidener, President and CEO, Breathe California. The essential skills required when responding to Ebola, such as contact tracing, isolation, quarantine and proper wearing and removal of personal protective equipment are all familiar. They do these things everyday to combat diseases such as tuberculosis. One third of the world is infected with Tuberculosis, or TB. That’s over 2 billion people. TB kills 1.3 million people each year worldwide. TB is a threat not just in other countries but also here in the United States. Every 4 hours a Californian is diagnosed with TB, and while there are medications to treat most strains of TB, about 9 percent of all Californians diagnosed with TB will not recover. TB is spread from person to person through the air when a person with active TB coughs and those around them breathe in the bacteria. Some people will live with TB infection without ever developing active TB disease. Others will progress to active TB that can spread from one person to another through the air. Californians need to know their risks, talk with their health care provider about their risks and get tested and treated if recommended. For information about TB, visit the California Tuberculosis Controllers Association website, http://www.ctca.org/. 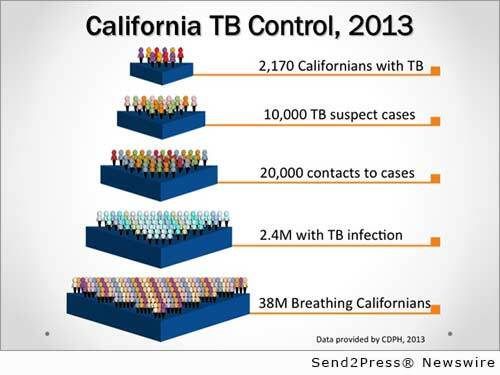 Original Keywords: Tuberculosis, Breathe California California Tuberculosis Controllers Association Oakland California OAKLAND, Calif.
Alternate Headline: With 2,170 cases of TB reported last year in Calif., TB control programs must be maintained says California Tuberculosis Controllers Assoc. The California Tuberculosis Controllers Association is made up of local public health providers working to eliminate TB in California by working with community medical providers in detecting, treating and preventing TB. Purpose: To eliminate the threat of TB from California through leadership and the development of excellence in TB prevention and treatment. REFERENCES: California Business News, Tuberculosis, Breathe California California Tuberculosis Controllers Association Oakland California OAKLAND, Calif.